You prefer natural homemade jam, but don't like long to bother with cooking, I'm afraid it will burn or encounter any problems? Cook it using the microwave, so you can save energy and nerves, quickly and easily getting the desired result. To prepare jam, assorted berries in the microwave, take 500 g of frozen or fresh berry blend, the constituent ingredients of which, for example, can be: strawberries, raspberries, blueberries and black currants. You will also need 500g of sugar and the juice of half a lemon. Gently wash fresh berries and clean them from the stalks. If the material is frozen, put it in a flat shape, cover, and defrost. Heat berries for 4-5 minutes on full power the microwave. Then grind them to obtain a puree and place the resulting mass into the form. Mix berry puree with sugar and lemon juice, boil it for 6-7 minutes at full power. Pour hot jam on banks. If you want to cook jam from blueberries, 6-8 take 125 g of berries and 100g of brown sugar. Thoroughly mix the blueberries with the sugar, place the resulting mass in a bowl for the microwave. Cook blueberry jam on medium power for 10 minutes. You can also cook in a microwave a delicious jam made from gooseberries. To do this, take 1 kg of grapes, the same of sugar and 300 ml water. Cook the syrup liquid of 300 ml of water and 200 g of sugar, it will take 6-9 minutes at full heater power. Selected gooseberries, place in syrup and cook it for 8-10 minutes until the berries won't burst. Add in the mass of the remaining sugar, stir and cook the jam for 15-20 minutes at full power, during this time, stir it 2-3 times. To prepare cranberry jam in a microwave oven you will need 1 kg of berries, 1 kg of sugar and 200 ml water. Cook cranberries in water for 10 minutes at medium power until, until the berries burst with. Sugar preheat for 10 minutes, selecting a full power mode and add to hot cranberries. The resulting mass stir and cook the jam until it thickens, for about 15-20 minutes at the maximum power level. Cook jam in a microwave can and raspberry. To do this, prepare 250 g of berries, and the same of sugar. Mix raspberries with sugar, cover the pan and cook for 5 minutes at maximum power. For the preparation of jam and marmalade in the microwave and use a large low bowl and do not forget to check the readiness of the product. Do not attempt to cook more than 1.5 kg of berries at a time. Put raw material to jam into a pan, with handles, it should be of no less than 4 liters. For soft berries extra fluid is not required for those who have a skin, for example, plums or gooseberry, may need about 50 ml of water or syrup 450 g of fruit. 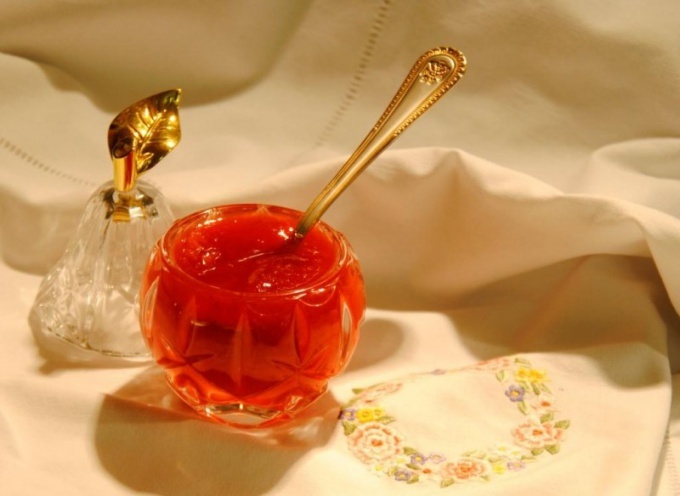 Remember that jelly and jams reach very high temperatures and a strongly heated utensils. Be sure to wear gloves when putting in or taking out a container of jam or marmalade from the microwave oven.